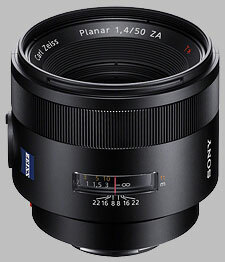 (From Sony lens literature) The new Carl Zeiss Planar T* 50mm F1.4 ZA SSM joins the existing Distagon 24mm, Planar 85mm and Sonnar 135mm in the A-mount range of prime length optics by Carl Zeiss. Offering a fixed 50mm focal length and extra-bright F1.4 aperture, the premium lens is an ideal choice for quality-critical portraiture and low-light shooting. Featuring 8 elements in 5 groups with two aspherical elements, the brand new optical design is optimised for superb results with Sony’s full-frame α99. Exceptional resolving power and contrast at all apertures are teamed with smooth, quiet autofocusing and a rear-focus system that maintains the same lens body length during AF. The dust- and moisture-resistant design extends the appeal of the new lens to a wide range of outdoor shooting applications. you can't be wrong with this purchase. the autofocus is lightning fast on a99 and perfectly accurate 99.9% of the time. the homogeneity is exemplary in every regard, at every aperture. bokeh is "only" good but smoother than any other sony compatible 50mm options. expected for this kind of lens anyway. contrast is absolute even wide open with light source in the frame, the T* coating works wonderfully. built quality is close to perfection, only the filter attachment and the hood are plastic. rarely you can find some traces of flare but it doesn't affect the contrast. expensive? yeah... but actually the cheaper among its pears (canon 50f1.2L and nikon 58f1.4G).